IUCN Near Threatened; estimated population 400,000. Once common in shrubby young forest within forested landscapes of the Midwest and East. Now restricted to two isolated populations in Upper Midwest and Appalachians. Winters in Central and northern South America. Habitat loss and hybridization with Blue-winged Warblers are major concerns. Read more at All About Birds. 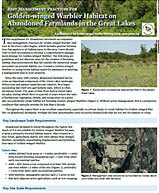 The Living Bird article A Golden Plan for a Turnaround (Spring 2013) goes into the field with researchers and also summarizes the state of research and the broad outlines of the conservation plan. Read it online or download a PDF. The range-wide Golden-winged Warbler Conservation Plan represents knowledge accumulated over 15 years of field surveys, genetic analyses, in-depth habitat studies, and other research. Habitat improvements for Golden-winged Warblers benefit 38 other early successional species, including Ruffed Grouse and American Woodcock. The plan was developed by the Golden-winged Warbler Working Group, which is a consortium of universities, agencies, and nonprofits including the Cornell Lab’s Conservation Science program. Who can help create and manage Golden-winged Warbler breeding habitat? 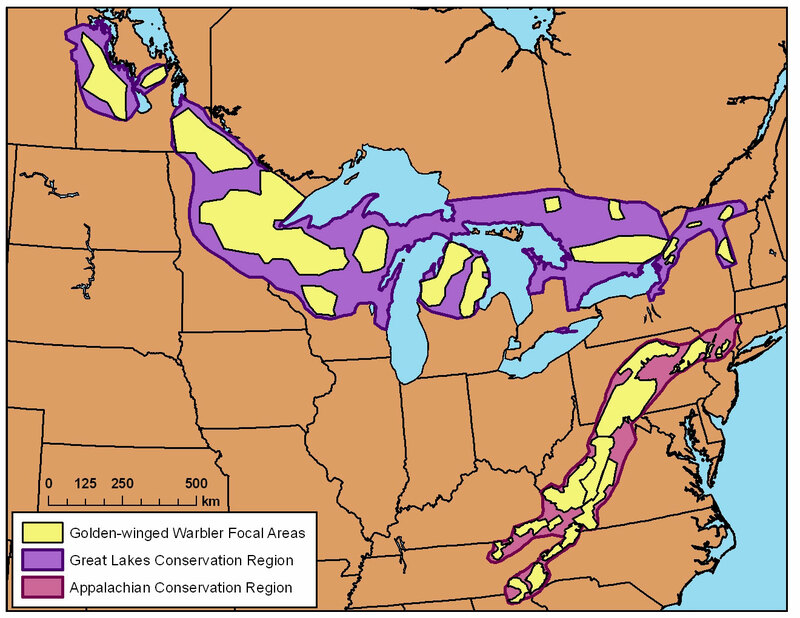 Anybody who manages an appropriate amount and type of land within the conservation focal areas for the Golden-winged Warbler, including managers of public land, land trusts, and private landowners. What kind of land is needed? 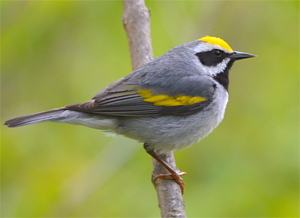 Golden-winged Warblers use young forest and shrubby habitats located in deciduous forest. Prime examples include young forest created through timber harvesting, abandoned farm fields, utility corridors, reclaimed minelands, and shrub wetlands. 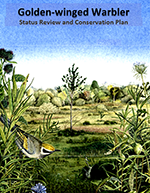 Golden-winged Warbler Conservation Plan: The Golden-winged Warbler Status Review and Conservation Plan plan offers a comprehensive species assessment and management strategy for Golden-winged Warbler conservation. It can be downloaded in its entirety or chapter by chapter. A chapter about wintering grounds conservation is planned for publication in 2014. Best Management Practices—Regional Guides: These guides—one for the Great Lakes region and one for the Appalachians region—are distilled from the plan to provide only the most important management actions. 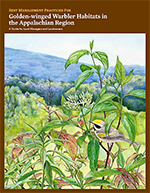 They provide land managers and landowners with science-based, regionally specific strategies and techniques for developing and restoring habitat for Golden-winged Warblers. 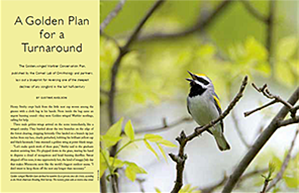 Habitat Supplements: These two-page documents provide specific guidance for 11 common habitat types within the Golden-winged Warbler’s range. They are concise and intended to be carried into the field to facilitate implementation. 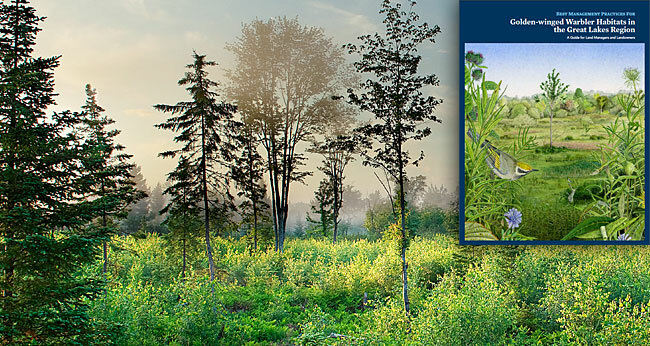 The federal Farm Bill’s Environmental Quality Incentives Program provides funding and technical assistance for the creation, management, and restoration of Golden-winged Warbler habitat (the Working Lands for Wildlife program was folded into this program in 2014). Through the Partners for Fish and Wildlife Program, the U.S. Fish and Wildlife Service funds projects for golden-wing habitat restoration.